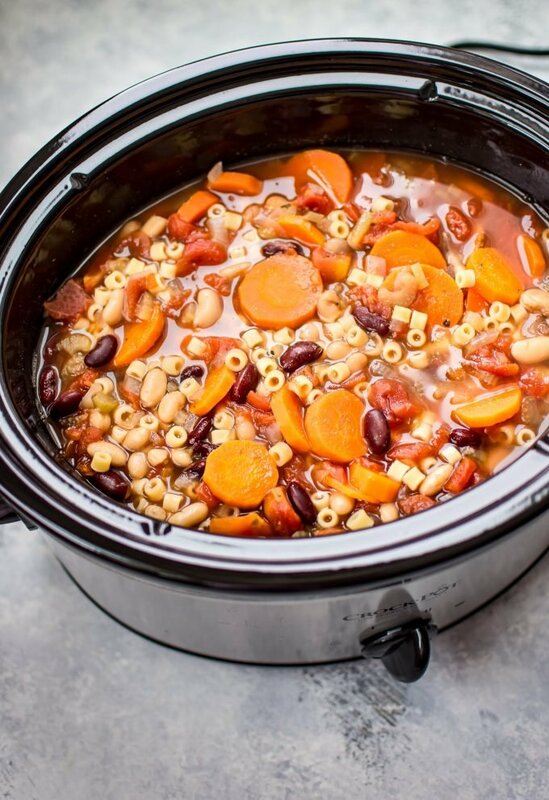 This Crockpot vegetarian pasta e fagioli soup recipe is a hearty and flavorful meatless meal that is easy to throw together so you have a hot meal ready with minimal effort! 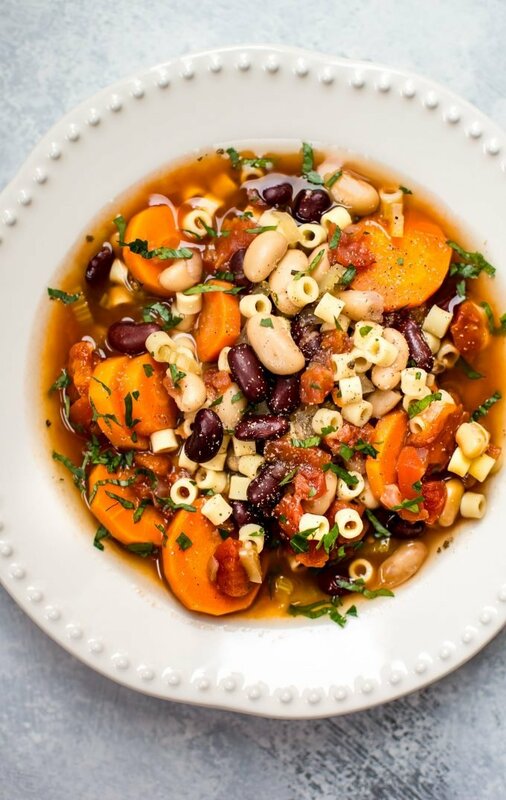 If you’re wondering what “pasta e fagioli” means… it’s simple. Pasta and beans! This soup is a classic Italian dish that’s well loved by many. It often contains pancetta, but I omitted it to make this dish veg-friendly. 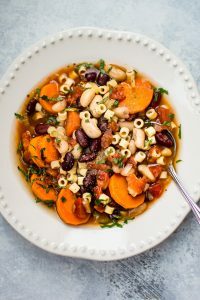 This easy pasta e fagioli soup tastes so good because the slow cooking perfectly melds all the flavors together. There really is a great depth of flavor in this soup, and we have no fancy ingredients here. Chop your carrots, celery, and onions. I chopped mine pretty roughly… we don’t need to be perfect for a rustic soup like this. Add all ingredients except for the pasta to a Crockpot and cook on low heat for 6-8 hours. About 30 minutes prior to serving, add the pasta in. I suggest giving it a stir every 10 minutes or so to prevent it from sticking to the bottom of the slow cooker. 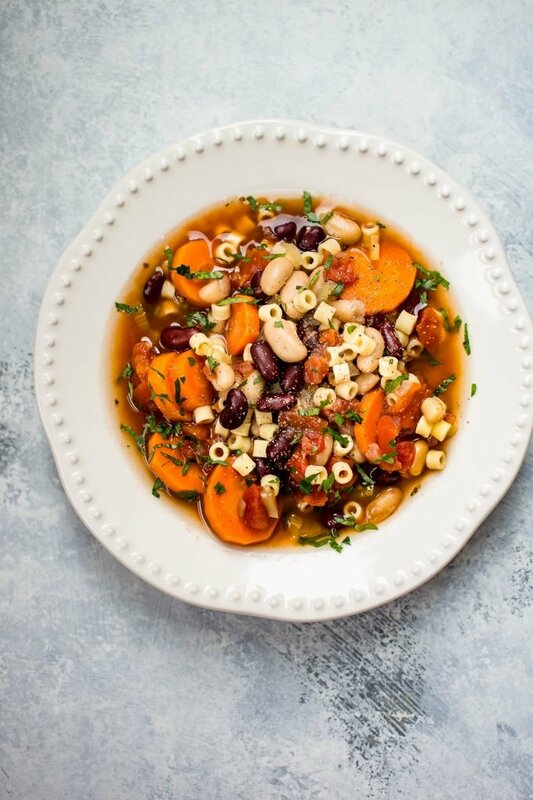 Pro tip: As with any soups that contain pasta, in my opinion, this healthy pasta e fagioli soup is best enjoyed right after you make it. The pasta will soak up some of the liquid the longer you leave it. Not a big deal, but I wanted to mention it. You can always add more vegetable broth to add more liquid back in the leftovers if needed. This recipe is the perfect set it and forget it recipe to put on this weekend before you go Christmas shopping. 😉 How is your shopping going, by the way? I still have some gifts left to buy, but I’m not doing too bad compared to many, I guess. If you love pasta e fagioli, try my easy stovetop pasta e fagioli recipe or my Instant Pot pasta e fagioli recipe. 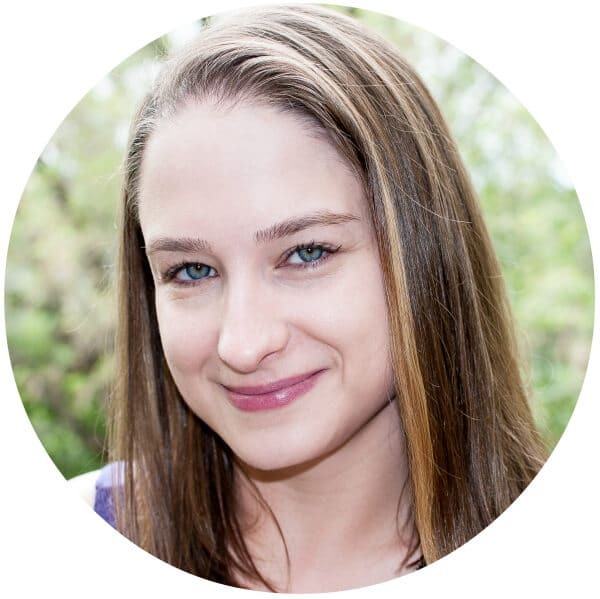 Anyway, I hope you love this vegetarian pasta fagioli recipe! What’s your favorite kind of vegetable soup? Prep your carrots, celery, and onions. Add all ingredients except for the pasta to a Crockpot and cook on low for 6-8 hours. About 30 minutes prior to serving, add the pasta in. I suggest giving it a stir every 10 minutes or so to prevent it from sticking to the bottom. Season with salt & pepper to taste and serve immediately. 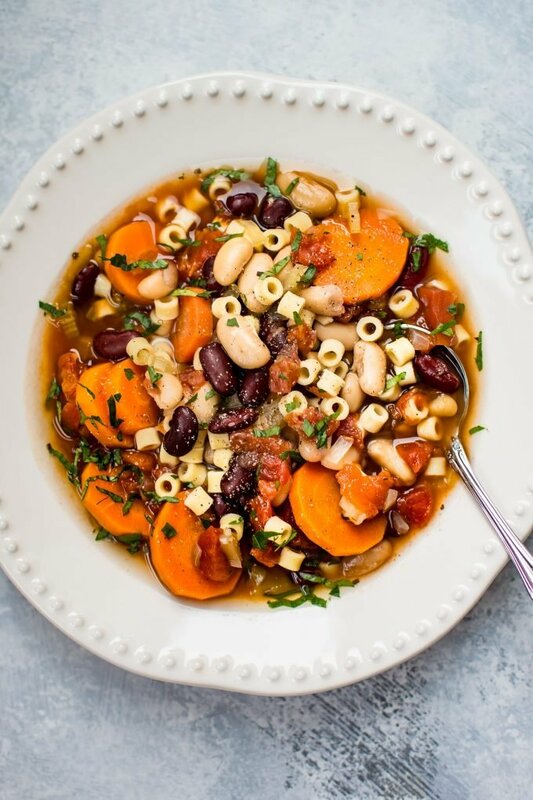 If you liked this pasta fagioli soup recipe, you may also like my vegetarian tortellini soup, vegetable and bean soup, or my creamy tomato gnocchi soup. Love that this is a crockpot recipe Natasha. I’m always looking for reasons to pull mine out of the cabinet. My husband loves crockpot meals too. I think it reminds him of his childhood! Aw that’s nice! I think we all have meals like that. Have a great weekend! Can I cook high 3-4hrs or does it need to be on low for longer?